My tryst with reading novels based on Indian mythology started with books like 'A Palace of Illusion' by Chitra Banerjee Divakaruni, Jaya by Devdutt Pattanaik. Soon many such books made to my to-read-list. One fine day, I sat searching for books based on Indian mythology that are available in the libraries here and the title that came up was 'Prince of Ayodhya' by Ashok K. Banker. Long back when I had written a post asking my fellow bloggers to suggest me good books by Indian writers, Vibha had suggested the Ramayana series by Ashok K. Banker. So, I went ahead to reserve it. My librarian told me that this book might be missing as she could not locate it in the shelves. I had given up hope that I would be get hold of this book here. But, to my sheer delight after a couple of months, I received the book. I have to praise the libraries here. They are really very well maintained and managed. 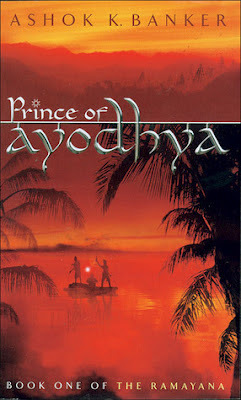 The Prince of Ayodhya is the book one of the six books of Ramayana series by the author, Ashok K. Banker. Ramayana is one of the two great ancient Indian epics, the other being Mahabharata. The original Ramayana—a classic tale of war between absolute Good and Evil—was written 3,000 years ago by Valmiki, a reformed thief-turned-sage. Now, with breathtaking imagination, Indian novelist Ashok K. Banker has recreated this epic tale for modern readers everywhere. Ayodhya, the Unconquerable is the legendary capital of warriors and seers, and the greatest fortress of the civilized world. Soon it will be a wasteland of ashes and blood. For Ayodhya lies in the shadow of a demon's wrath—a demon that is sending all its dreadful power to ravage the world of mortals. And only Rama, Prince of Ayodhya, can hope to prevent the onslaught of darkness. The book was every bit fascinating that I expected it to be. Even though I have read that the author has added his own imagination in the story telling and that his version of the story deviates a lot from the original Ramayana, the novel refreshed a lot of my childhood memories that I had of the epic saga. All thanks to the Ramayana TV serial that was telecast-ed on Doordarshan in those days. The author has given a lot of attention to main characters and they are beautifully sketched. As you read the novel they will be well etched in your mind. The book also dwells on relationships - the brotherly love the four brothers shares, the relationship King Dasratha has with his queens, the respects disciples have for their guru, the love and concern queens have for their sons. Not only that negative emotions are also given ample space in the narration. Queen Kaikayi and her aide Manthara are characters you won't forget, not to mention the devil king Ravana! They have bigger roles to play in the next books of the series. The plot is gripping, the narration never falters, the subtle details of Dharma and Adharma will keep you engrossed till the end. If you have the slightest interest in Indian mythology, this is the book you can't miss. I can't wait to read rest of the series. Highly recommended. Lovely review Jyoti. I recently reviewed 'The Forest of Stories' by Ashok Banker and I like his way with words. Looking forward to 17 more books in the series.